I stroll through Amazon from time to time seeking out new sashiko books to add to my library. It doesn’t matter what language they are in, all are welcome. This slim volume starts off with a visual bang for me right on the cover with a cast iron teapot on top of a stack of sashiko textiles. It’s all blue and white from the start, and continues that way for the next 64 pages. There is a section in the beginning with the usual “do this, don’t do that” graphics, which are always a nice reminder that while sashiko is a technique with rustic roots, it still has rules. Projects include a selection of traditional geometric designs, a few cranes and the like, and several florals. The florals are based on Japanese designs, but they appear more European to me, and I like the dichotomy. I think I actually squeed like a schoolgirl when I saw “Rechteckiges Kissen”, the large indigo pillow with a spider mum in white on page 16. Even better was “Betttuch und Kissenbezüge”, the lovely set of ivory bed linens with indigo flowers on page 12. The photos are not unlike those of a Japanese craft book, but darker and moodier with a touch of hope, like a Nordic spring. I’m of Northern European roots, so the visuals really resonate for me. The colors are so cool, but the textiles so inviting, especially “Plaid”, the creamy white wool flannel blanket with indigo stitches on page 30. You won’t find that in any Japanese sashiko books, at least none that I’ve seen. I’d never thought of working with fuzzy or fluffy knits, either, which is exactly why I think this is a book worth having; it stretches the imagination to include a different view of what sashiko is. The Japanese do sashiko so well, and even Silvia Pippen with her tropical designs sheds a new light on this old task, but to take something traditional to one country and make it look like it naturally belongs in yours… that’s magical. I’m happy to see an artist do it so well. 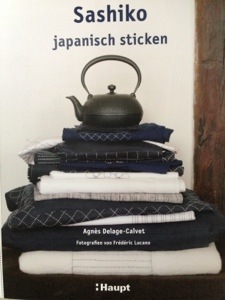 If you already have a working understanding of how to do sashiko, this book will serve as delightful visual inspiration. If you are a beginner and only read English, it might be a nice book to have for later. If you read German, go for it. I took a year of German in high school and barely remember any of it, so I enjoy the pictures and leave it at that. Besides, my German language teacher was Austrian and the book publisher is Swiss, so there may be differences… Sadly, I confess I have no clue.